Cape Town is a beautiful city, but we didn't see it right away. When we arrived to Cape Town, which was the finish line for our cycling race across Africa, we couldn't see a thing. The entire city was draped in with fog. We had been told how beautiful Cape Town and Table Mountain were but couldn't see them. Finally after three days the fog lifted and we were shown the beauty of this city. To us it really is the most beautiful city in the world. How could it not be with Table Mountain as it's backdrop. 13 Responses to "Table Mountain in Cape Town, South Africa: Snapshot Sunday"
.-= Asian Market Girl´s last blog ..China mines still deadly- as bosses ordered below =-. wow, first it’s an amazing shot. I love how the mountains play a nice backdrop against the modern looking building. I didn’t know Capetown is this beautiful. What else did you do over there? We cycled from Cairo to Cape Town so we were in South Africa for over a month. We entered at the Namibian border and worked our way down the Western Cape. In Cape Town we spent a lot of time at the V & A waterfront where we stayed and then went to Simon’s Town to see the penguin colony, the Cape of Good Hope, Franshoek, the Garden Route and Stellenbosch. We would go back to South Africa in a heartbeat. It was beautiful! .-= Sarah´s last blog ..Pier 66- The Frying Pan =-. Wow that really is a gorgeous picture. I think a few days of fog would be totally worth it to see a view like that. .-= Alouise´s last blog ..List 9 – How To Have A Cheesy Time At West Edmonton Mall =-. You are right, I think that the fog made Cape Town even more beautiful once it lifted. The scene was definitely worth the wait. 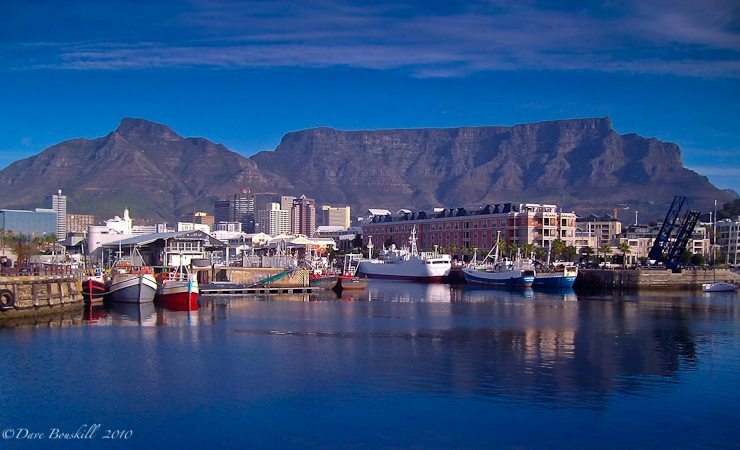 What a great shot of Table Mountain! Absolutely lovely!